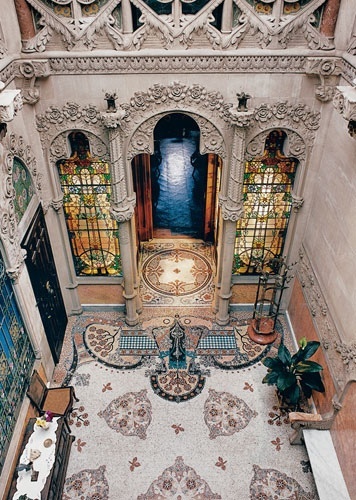 Casa Navàs is a modernist buildings in the city of Reus, Catalonia, Spain. Casa Navàs is a building designed by Catalan architect Lluís Domènech i Montaner, located in the city's Plaça del Mercadal. Joaquim Navàs Padró of Reus contracted Lluís Domènech i Muntaner as the architect of his new house. The building was constructed from 1901 to 1908. The building had a tower on the left facade, but it was destroyed by the bombing of dictator Franco during the Spanish Civil War and never rebuilt. Inside the building is a very wide and brightly lit space. Marble works were done by Alfons Juyol i Bach, the paintings by Tomàs Bergadà, the furniture by Gaspar Homar and the ceramics by Hipòlit Montseny; all of them under the instructions of Lluís Domènech i Montaner.